The Oregon men’s basketball team was honored today as Oregon senior guard Joseph Young was named the 2014-15 Pac-12 Player of the Year. 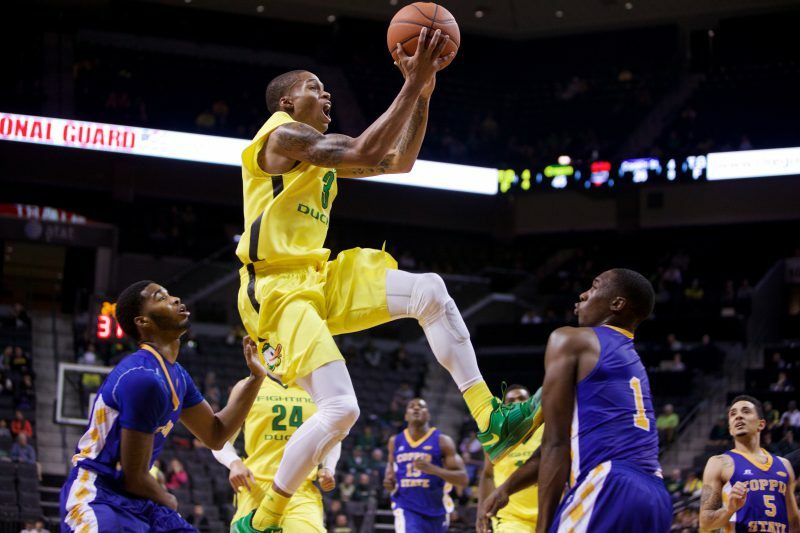 Young, who was also named to the First Team All-Pac-12, becomes the fourth Duck in conference history to win the prestigious award, joining the elite company of former Oregon hardwood greats Terrell Brandon, Luke Ridnour and Ron Lee. Young’s experience, leadership, and scoring consistency throughout the season has helped guide the team to a record of 23-8 overall (13-5 Pac-12). Oregon finished the regular season tied for second place in the Pac-12 after being picked to finish eighth by the media in the annual preseason Pac-12 Men’s Basketball poll. Young becomes only the fourth Oregon Duck in conference history to win the prestigious Player of the Year award. In his two seasons with the Ducks, Young’s impact has been tremendous, accumulating 1,257 points, second only to Oregon’s Terrell Brandon (1,263 points). This season, Young averaged 19.8 points and 3.7 assists a game, and the gifted guard also led the conference this year in free throw percentage (.918) and three-point field goals made per game (2.5). Young will hope to help keep the Ducks’ magical season alive as they head to Las Vegas for the Pac-12 tournament. Despite the outcome of the conference tournament, Young’s remarkable career in Eugene will continue with the Ducks all but ensured an outright invitation to the NCAA tournament.